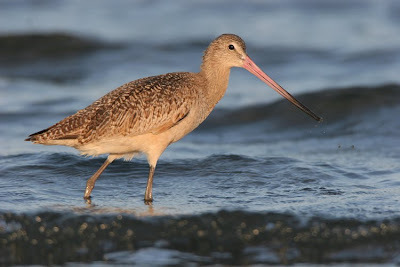 The Migratory Bird Conservation Commission recently approved 35.7 million for refuge acquisitions and wetlands grants for migratory birds: $30.4 million for grants to conserve more than 319,000 acres of wetlands and associated habitats in the United States and Canada under the North American Wetlands Conservation Act and $5.3 million in Federal Duck Stamp funds to add more than 1,849 wetland acres to six refuges in the National Wildlife Refuge System. The six refuges that will increase in size, thanks to the $15 purchase of the annual Duck Stamp, include Cache River National Wildlife Refuge in Arkansas, Stone Lakes National Wildlife Refuge in California, Edwin B. Forsythe National Wildlife Refuge in New Jersey, Silvio O. Conte National Fish and Wildlife Refuge in Massachusetts, Lower Hatchie National Wildlife Refuge in Tennessee, and San Bernard National Wildlife Refuge in Texas. Among birders, the auto drive at Ding Darling National Wildlife Refuge on Florida's Sanibel Island often ranks high on their wish lists. The four-mile route puts birders close to Roseate Spoonbills, Wood Storks, Reddish Egrets, Little Blue Herons, Yellow-crowned Night-Herons, Anhingas, American White Pelicans, Red Knots, Marbled Godwits and Bald Eagles as well as otters, bobcats and alligators. No wonder it's well-known! The national wildlife refuge system includes many more sites with auto routes, and the U.S. Fish & Wildlife Service wants everyone to enjoy them. What's even better is that if you buy a Duck Stamp for $15, you can enter refuges without paying entrance fees. 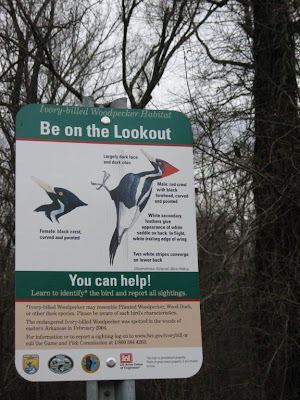 Consider a drive at Bombay Hook National Wildlife Refuge near Smyrna, Del. 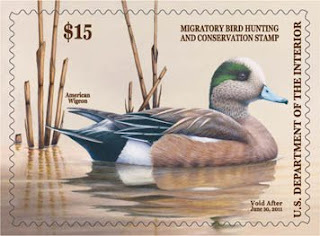 ; Seney National Wildlife Refuge near Seney, Mich.; Des Lacs National Wildlife Refuge near Kenmare, N.D.; and Ridgefield National Wildlife Refuge near Ridgefield, Wash.
Mark this Friday on your calendar as your first opportunity to purchase the 2010-2011 Duck Stamp. The $15 stamp gives free access to national wildlife refuges from July 1 to June 30, and 98 cents of every dollar goes into a fund to purchase or lease wetlands and grasslands. The new stamp depicts an American Wigeon, painted by Robert Bealle of Waldorf, Md. His artwork earned first place last fall at the Federal Duck Stamp Art Contest, held at the Patuxent Research Refuge in Laurel, Md. Since 1934, each waterfowl hunter must purchase a Federal Migratory Bird Hunting and Conservation Stamp to legally hunt migratory waterfowl. Through stamp sales, more than $750 million has gone toward conserving more than 5.3 million acres that benefits waterfowl, other bird species and various wildlife. The stamp proceeds benefit birders as much as they do hunters. Although many birders express anti-hunting sentiments, WildBird supports the practice of legal hunting that falls within the guidelines set by scientific wildlife management. Because hunters have contributed directly and enormously to habitat conservation for almost 80 years, we respect their contributions that aid the birds we enjoy so much. We sincerely hope that birders will purchase the stamp this year -- and in future years -- to directly contribute to more habitat conservation. 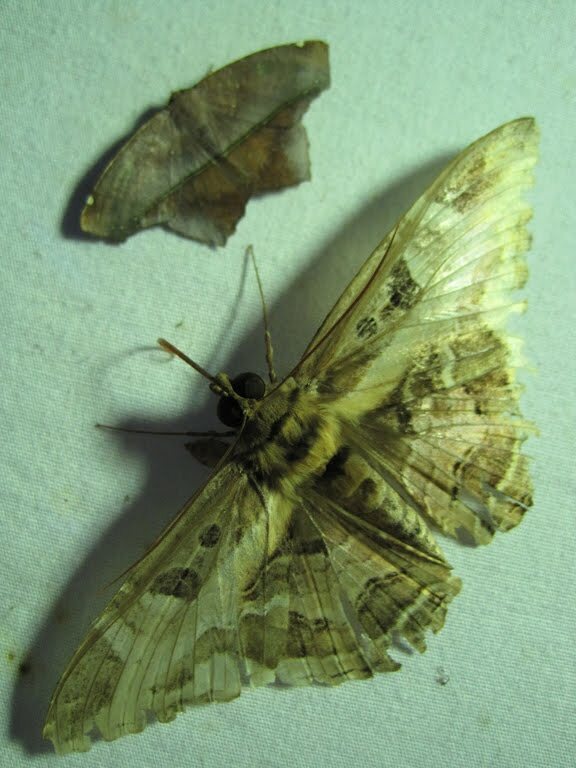 The fourth annual celebration of pollinators -- those birds, bees, butterflies, birds, bats and other creatures that contribute to humans' food supply -- began yesterday. U.S. Secretary of Agriculture Tom Vilsack pointed out that pollinators play critical roles in the reproduction of 90 percent of flowering plants and one-third of human food crops. 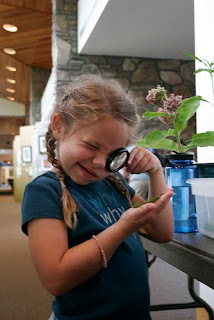 The National Pollinator Week kit provides great resources about pollinators and for NPW events. The "For Kids" section includes a pollinator crossword puzzle, details about building a bee condo and a list of five things that children can do to help pollinators. The "Fast Facts" section offers a page for educators and students, and it provides a link to a curriculum for grades 3-6 from North American Pollinator Protection Campaign. The curriculum includes six modules and points out that more than 150 food crops in the U.S. depend on pollinators, including apples, almonds, blueberries, cranberries, melons, pears and plums. North American Pollinator Protection Campaign offers more details on its website, including information from a 2006 study that described the decline of pollinator populations, including hummingbirds. WildBird offers its readers a really neat opportunity in every issue. The magazine poses to two questions in each issue, readers can respond to one or both, selected replies appear in a future issue, and one of those respondents receives prizes from Swarovski Optik and Houghton Mifflin Harcourt -- and the chance to win a Swarovski binocular and a trip to a birding hotspot as Birder of the Year. We've been fortunate enough to offer a trip to Costa Rica for three years, and the 2009 Birder of the Year recently returned from her trip. 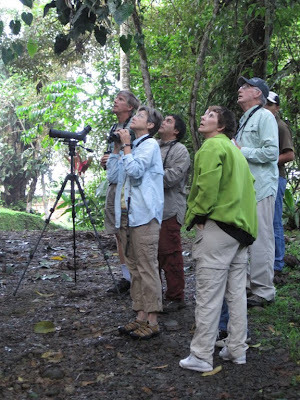 As 2009 Birder of the Year, Dianne Patterson of Columbus, Miss., received a Swarovski 8x32 EL binocular and an expenses-paid five-day trip for two to Costa Rica with Swarovski and WildBird hosts. She also received a Swarovski squall jacket as well as “Peterson Field Guide to Birds of North America” from Houghton Mifflin Harcourt. 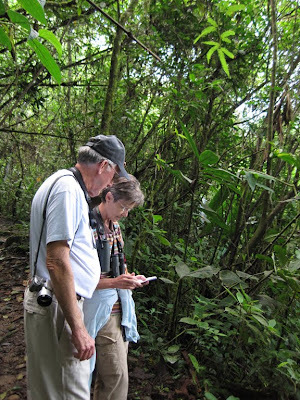 Dianne, her husband Jim, Clay Taylor of Swarovski Optik and I flew to Costa Rica in late May to bird with Clay's Costa Rican colleague, Alex Villegas. Aided by our driver, Rafael, we covered a fair bit of ground starting May 27. 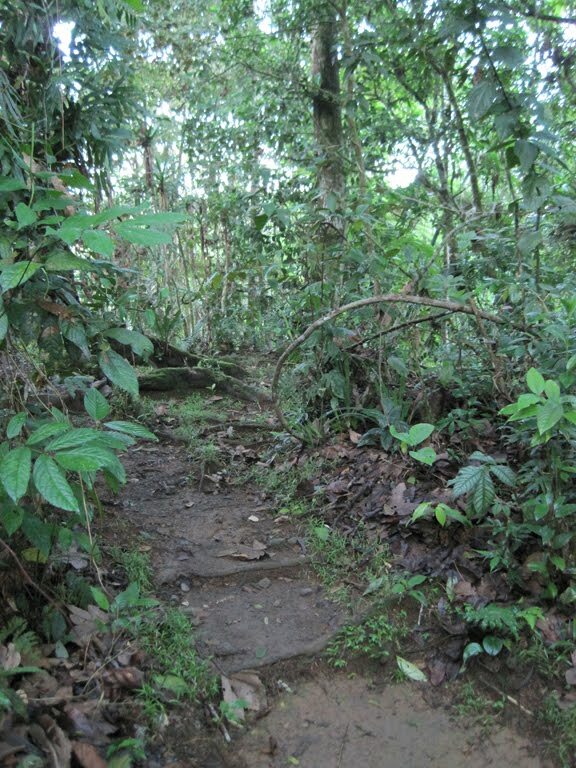 Here, all together, are photos of where Dianne and Jim went and what they saw during their first trip to a cloud forest and a rain forest. Every year on June 20, American Eagle Foundation and thousands of Americans celebrate Bald Eagles. American Eagle Day reminds U.S. residents that Bald Eagles still need help. "The bald eagle has been taken off the ESA's threatened species list, but that doesn't mean it has fully recovered and won't continue an up-hill fight for survival. In an era of government budget cutting, it will cost millions of dollars to monitor and protect eagle nests and adjacent ecosystems on private lands nationally for the remainder of this decade and beyond." Learn more about Bald Eagles, and listen to its calls. 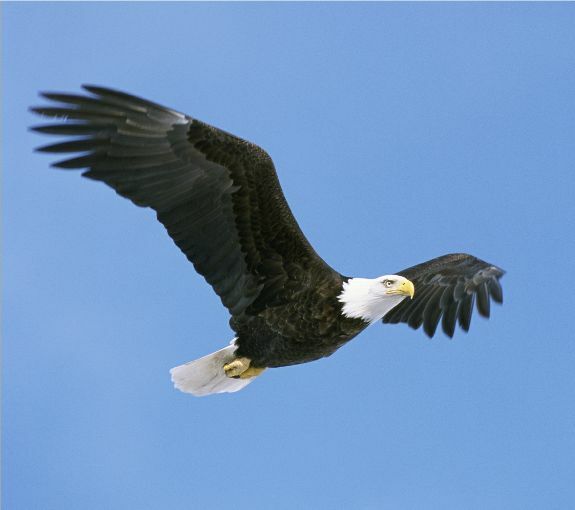 What can you do this weekend to teach others about our national symbol? Background info: WildBird offers its readers a really neat opportunity in every issue. The magazine poses to two questions in each issue, readers can respond to one or both, selected replies appear in a future issue, and one of those respondents receives prizes from Swarovski Optik and Houghton Mifflin Harcourt -- and the chance to win a Swarovski binocular and a trip to a birding hotspot as Birder of the Year. We've been fortunate enough to offer a trip to Costa Rica for three years, and the 2009 Birder of the Year recently returned from her trip. but it eventually retreated from the feeder and into the leaves. 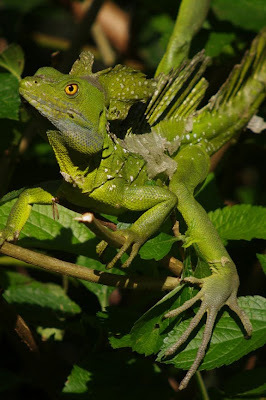 This species (Basiliscus plumifrons) can grow up to 3 feet long. Someone's keen eyes -- was it Cali? or Alex? -- spied two birds hidden well in the dense leaves. Everyone got to gaze on their still and stern visages, and then the photographers (from left: Cali, Alex and Clay) went into action. 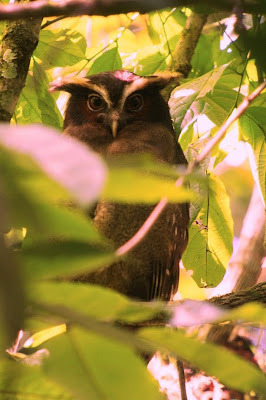 The object of their attention: Crested Owls perched side by side. We didn't hear them call, but listen to the second recording here. Kinda cool. 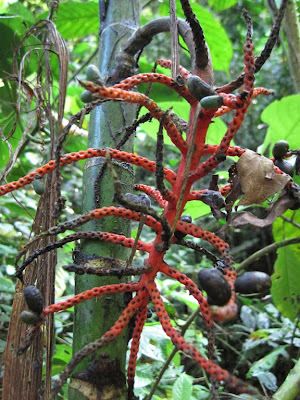 Further along the trail, we reached the hummingbird feeders, which were being guarded by a Bronze-tailed Plumeleteer. (Is that a great name, or what?) 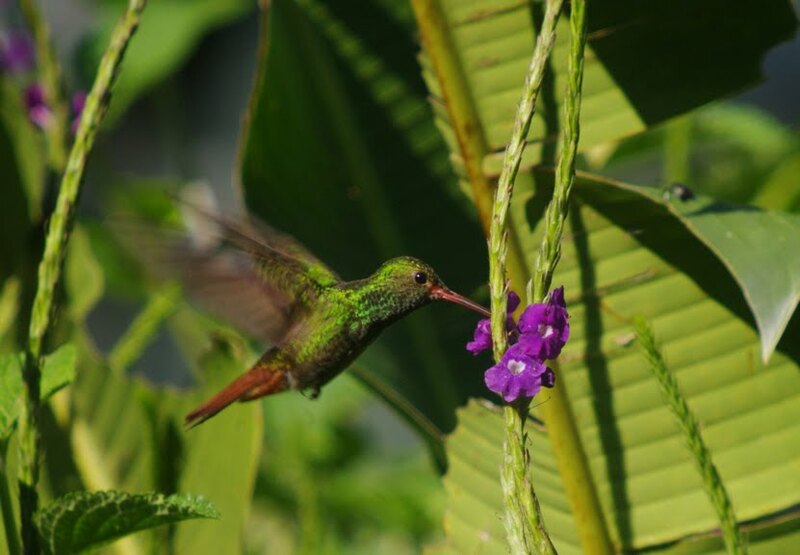 The 4-inch hummingbird has pinkish-red feet and used to be known as Red-footed Plumeleteer. We also got to see a Green Thorntail, one of the cutest little hummingbirds with a white rump band. 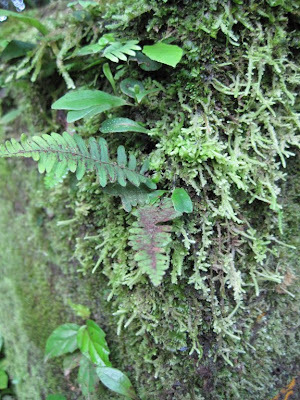 Amazing what you see while walking through the rainforest. 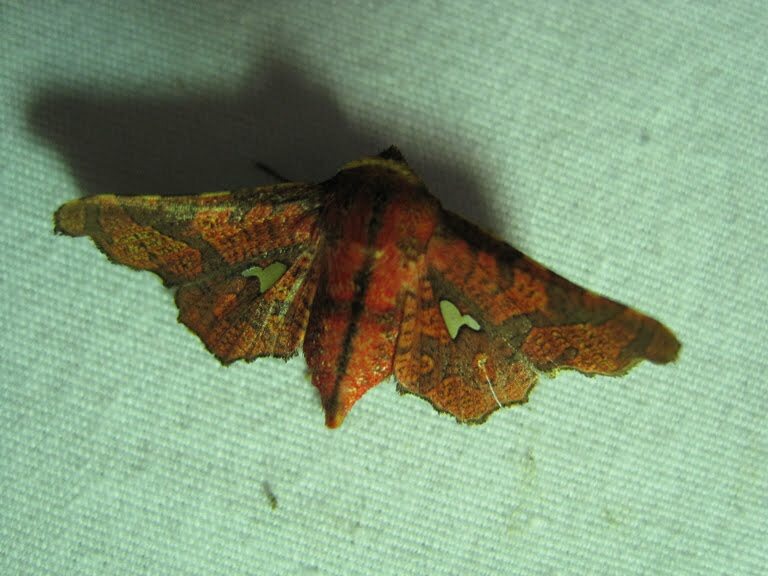 Doesn't this look like an alien? Then we came upon a huge fig tree, full of activity and a mixed flock. Because of the experienced eyes in our group picking out movement and calling out locations, we got to see Wedge-billed Woodcreeper with its upturned lower mandible; Spotted Woodcreeper; Tropical Gnatcatcher; Golden-crowned Warbler (known for its whistle that ends on an up note; listen to the third recording); Ochre-bellied Flycatcher; Lesser Greenlet, a vireo that looks and acts like a wood-warbler; and Scale-crested Pygmy-Tyrant, a 3-inch flycatcher that's barely bigger than its name. What an excellent tree. 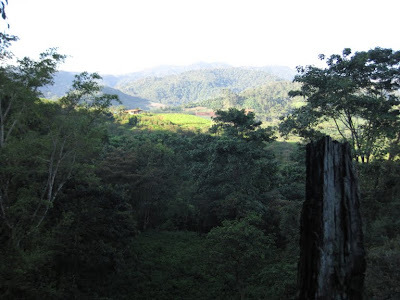 and we walked out of the forest and into an orchard that's returning to nature. A delightful stroll took us back to the lodge, where we enjoyed its hospitality before departing to San Jose. 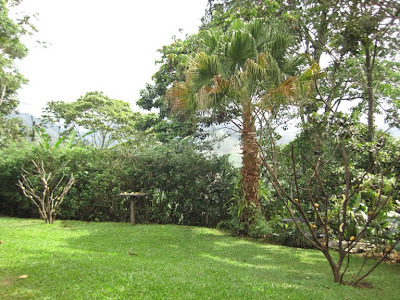 A seat on the patio gives you a view of the birdbath and the valley below; wouldn't you like to be there? Today, the U.S. 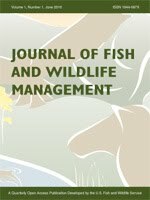 Fish & Wildlife Service announced the first issue of "Journal of Fish and Wildlife Management" and the re-launch of "North American Fauna," both online only. 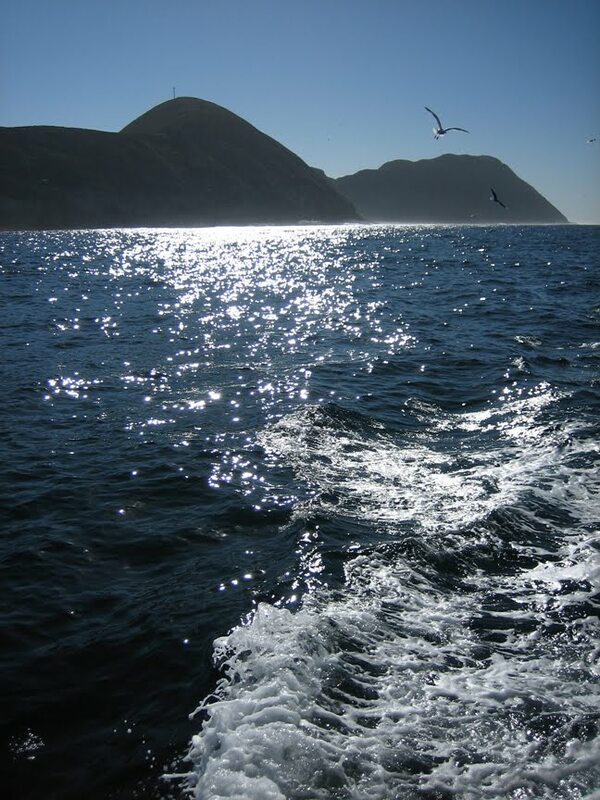 They will highlight "the practical application and integration of science to the conservation and management of North American fish, wildlife, plants, and the ecosystems upon which they depend," and they aim to provide more access to peer-reviewed research that contributes to "science-driven wildlife management." "North American Fauna" began in 1889 and continued through issue #76 in 1991, which included a monograph titled titled "Birds of the Kilbuck and Ahklun Mountain Region, Alaska." Click on the first link above to learn about submission criteria and guidelines. 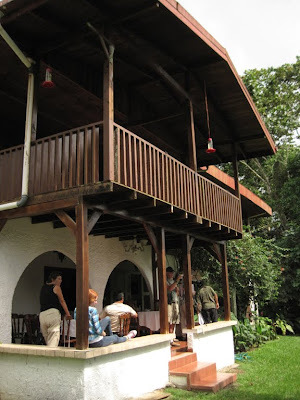 After our visit to the moth tent at Rancho Naturalista, we began birding at the front of the lodge. 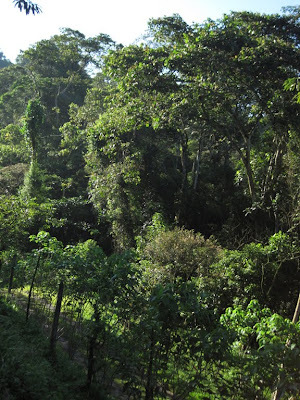 The trees overhead and surrounding vegetation drew Cinnamon Becard, a White-breasted Wood-Wren and other species. 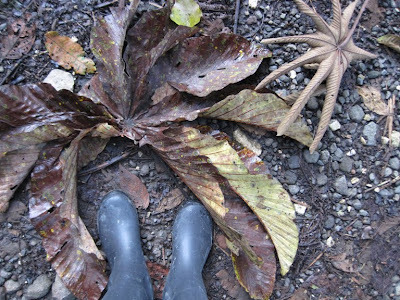 We continued walking down the road, decorated with cecropia leaves. By the way, I can't recommend the rain boots in the photo above highly enough. The Chooka boots' soles provided great traction on the slippery surfaces encountered during our trip, and they kept my feet warm and dry. In fact, our guide, Alex, asked me about them because he wants to buy lightweight rain boots with good traction. but we remained in the shadows, admiring the dense life that grows on anything and everything, like a concrete barrier on a small bridge. 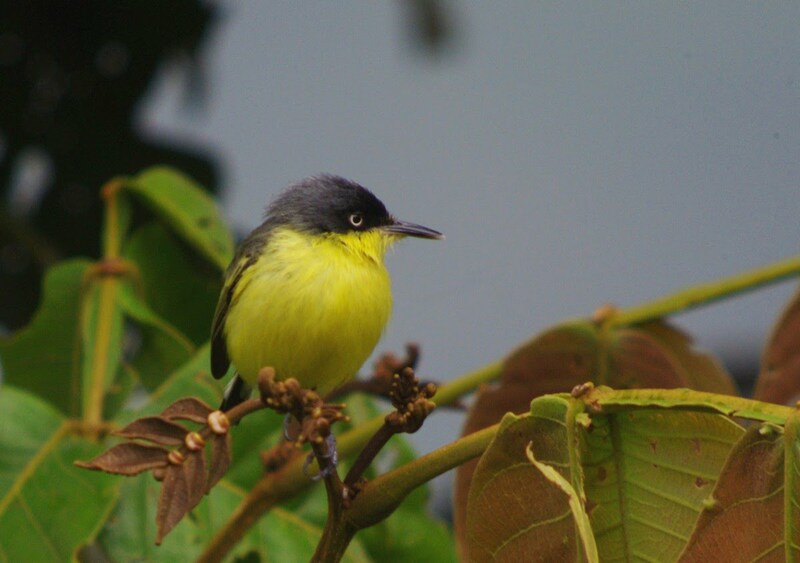 We sought a White-collared Manakin, one of eight manakins that live in the Neotropics and eat mainly fruit. 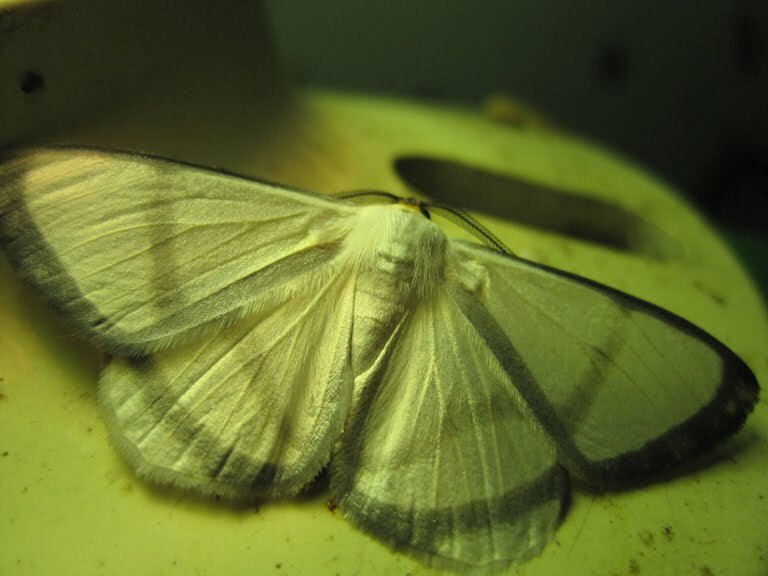 The male of this species makes a loud "snap" with his wings, which you can hear in some of these recordings. Alex used two rocks to replicate the sound, and his efforts eventually drew a male within view of our group. Such a dapper-looking fellow in the shadows. The manakin's admirers, from left: Clay, Dianne, Alex, Debbie, Grace, Jim and Cali (sp?). After finding the treasure of our scavenger hunt, we returned to the lodge for breakfast, enjoying good looks at multiple Slate-throated Redstarts along the way. They make beautiful little songs, and I didn't know that it's a wood-warbler and in the same family as one of my favorites, Common Yellowthroat. That was the last of our sightings before enjoying a delicious breakfast at the lodge. Blue-gray Tanager, Social Flycatcher and Orange-billed Sparrow. That sparrow's bill appears so bright that it seems as if it contains a lightbulb. 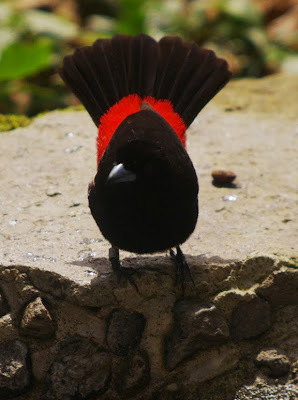 Bay-headed Tanager -- with its reddish-brown head and turquoise breast -- also blew me away. 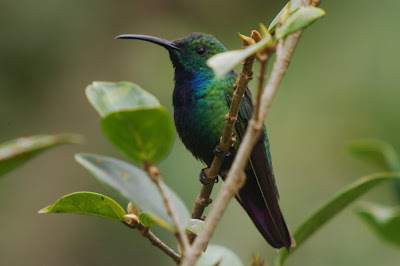 The variety of hummingbirds, however, didn't end with the species mentioned in an earlier post. 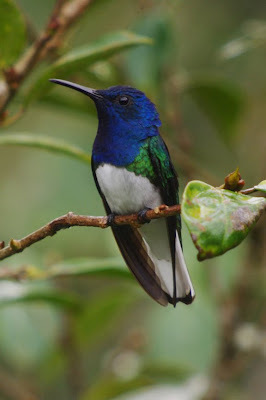 The roster also includes Green-crowned Brilliant, Violet Sabrewing, Brown Violet-ear, Violet-crowned Woodnymph and Green Hermit. All those species... appeared in a few hours... while we sat on the patio or rocked on the veranda. How cool is that? 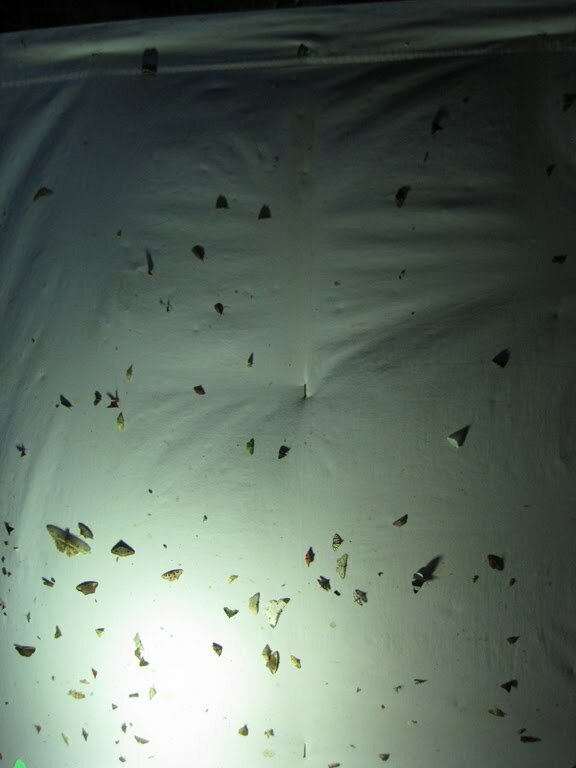 and brought us to what I considered a moth tent. The dark tarp housed a white sheet, a bright light to draw insects, two benches for viewers, and a buffet for birds. Standing a few feet from the sheet, we could see birds as they foraged on the ground and in the plants around the tent. 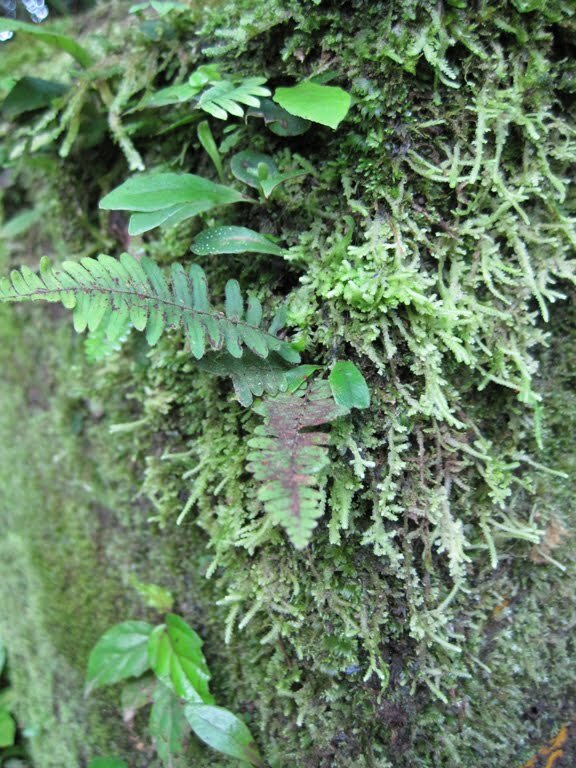 We enjoyed great looks at Red-throated Ant-Tanagers, Tawny-chested Flycatcher, Plain Antvireo (What a fun song it has! The tail end of it reminds me of a bouncing pingpong ball.) 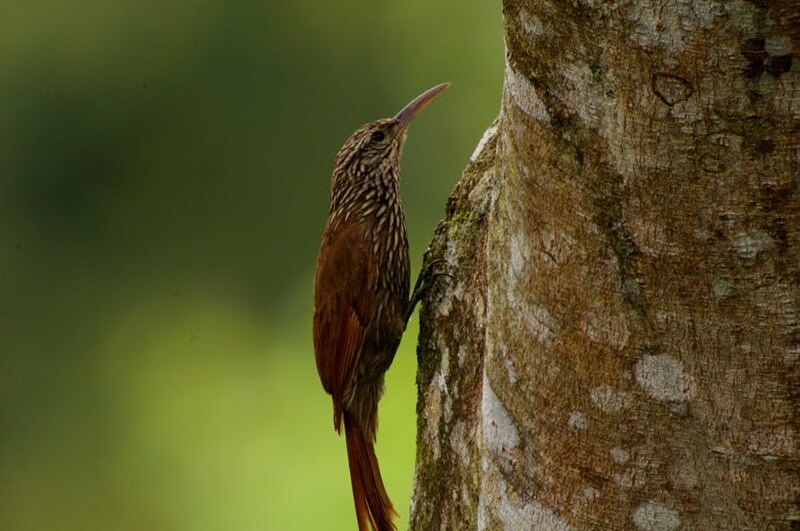 and Buff-throated Foliage-gleaner. After feasting our eyes on the Resplendent Quetzal, we continued the drive away from Savegre Mountain Hotel and San Gerardo de Dota. 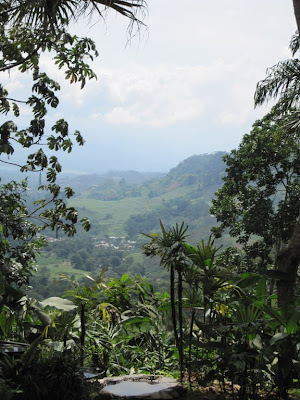 Rafael piloted the bus north and east toward our next lodging: Rancho Naturalista, located east of San Jose and Turrialba. New to the site, I immediately felt comfortable. 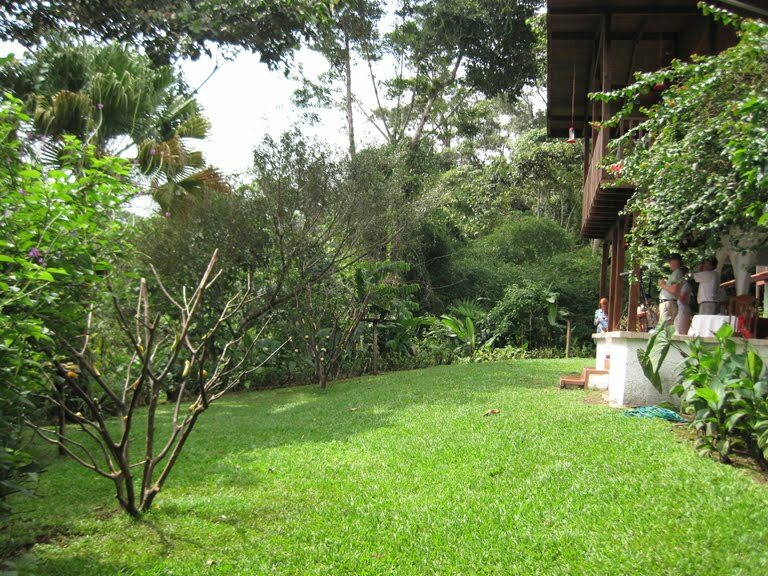 The friendly staff put us at ease, the main house looked wonderful, the patio offered the perfect location to eat and watch birds -- and did we watch birds! From that patio and the upper veranda, we enjoyed close looks at gobs of species, drawn to the foliage, the fresh bananas and orange halves supplied by the lodge's staff, and the many sugarwater feeders strung along the veranda. These two images give you an idea of the enticements that lured the birds into view. The two manzanita feeders held lots of cut fruit, as did two platform feeders in the yard. A ground-level birdbath provided some fun moments, and the bougainvillea growing along the veranda served as a perching station for many hummingbirds. Here's a quick peek at the hummingbird action at one feeder -- one of seven hanging along the veranda. 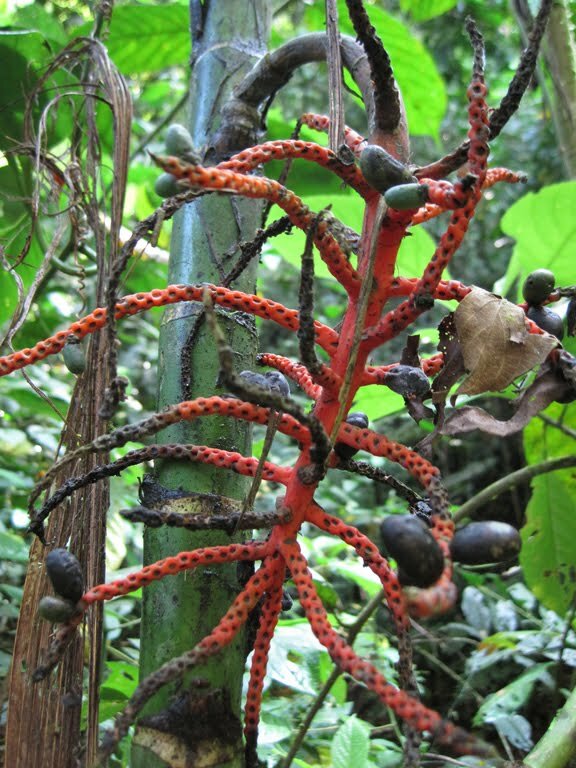 Can you identify the various species, including the female Green-breasted Mango? Did you catch her? Clay captured a female with her tail feathers spread and her dark median stripe in full view. Her underparts look considerably different from the male of the species. All photos by Clay Taylor/Swarovski Optik Digiscoping. 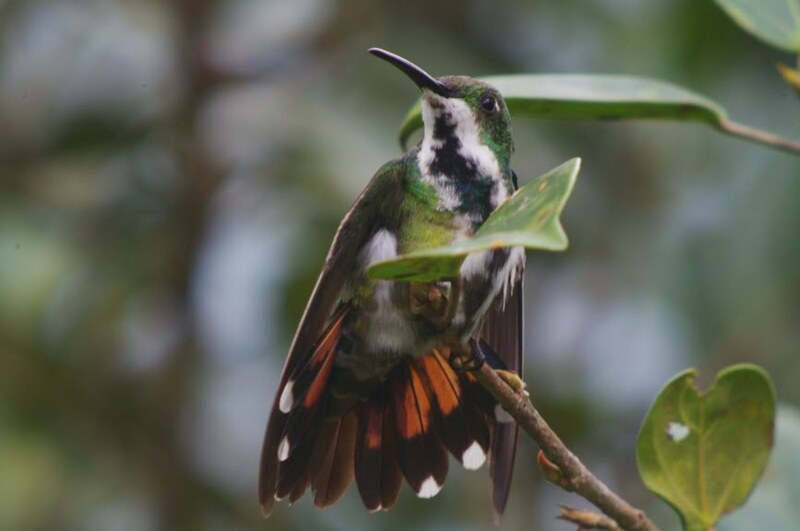 from Rufous-tailed Hummingbird, which also shows a green back and breast but has a lighter bill and a -- surprise! -- rufous tail. 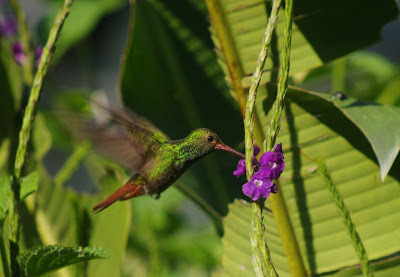 In the video above, you likely noted the hummingbirds with rufous tails as well as the ones with white tails, often flared. 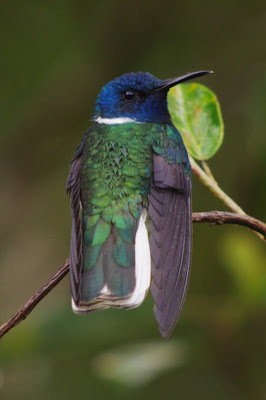 Those little dynamos, White-necked Jacobins, might've been the numerous hummers in my view. 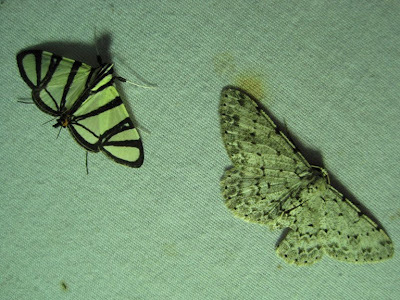 Although we saw them mainly at the feeders, they also catch insects in mid-air, according to Richard Garrigues. Earlier this month, an article titled "The 20 Worst Charities in America" listed nonprofit organizations by the percentage of their income that goes to administrative expenses, based on research by Charity Navigator. The independent charity evaluator describes its methodology here; it uses "charities’ disclosure statements to the IRS to provide donors with an assessment of how well charities run themselves," according to the MainStreet.com article. The article aimed to highlight charities with the highest administrative expenses and to point out which groups could use donations more efficiently. Donors want to see their money go to the programs that pull their heartstrings - not to pay for rent, paper for the copier and executives' salaries. Well-known for its many programs focused on the protection of biodiversity and the environment, the National Audubon Society, based in Washington, D.C., has chapters across the country, run independently of the main office. 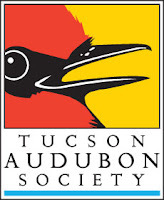 Its affiliate in Tuscon, Arizona, which fosters interest in and conservation of the bird population of southern Arizona, has seen its administrative costs skyrocket as the recession has eaten into its incoming donations. Partially due to Executive Director Paul Green’s inflated salary of $78,800, which accounts for more than 7% of the group’s expenses, the Tucson Audubon Society spends almost as much for its office as it does on the birds it aims to protect. Like the Tucson Audubon Society, the New Hampshire chapter of the bird-friendly conservation group [Actually, New Hampshire Audubon is independent of NAS. -akh] has also struggled to maximize the amount of donations that go toward its environmental programs. Much of the administrative costs can be traced to the group’s seven visitor centers that it runs throughout the state, where staff organize classes, summer camps, and activities for children and adults. 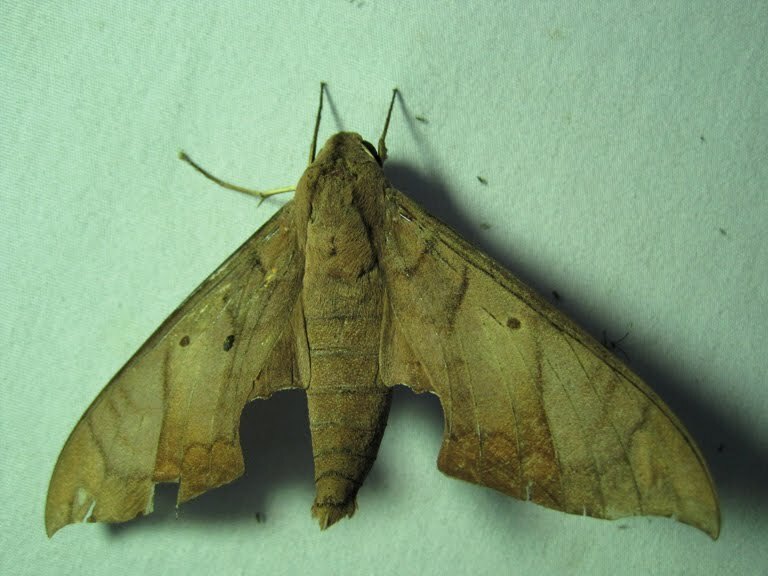 These fixed costs mean that in lean years for donations, it is hard for the New Hampshire Audubon Society to trim down their considerable administrative expenses. 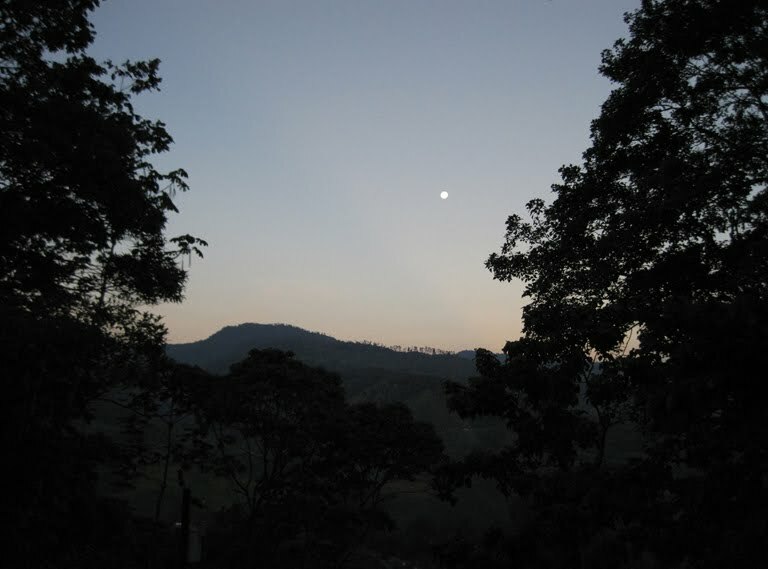 We left Savegre Mountain Hotel in San Gerardo de Dota soon after finishing a good breakfast, but we didn't travel far on the gravel road up the valley before our driver stopped per Alex's directions. 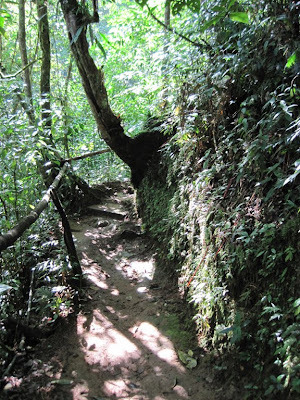 Alex had heard about a nest visible from this stretch of the road -- a Resplendent Quetzal nest. Could we find it and see a quetzal or two? 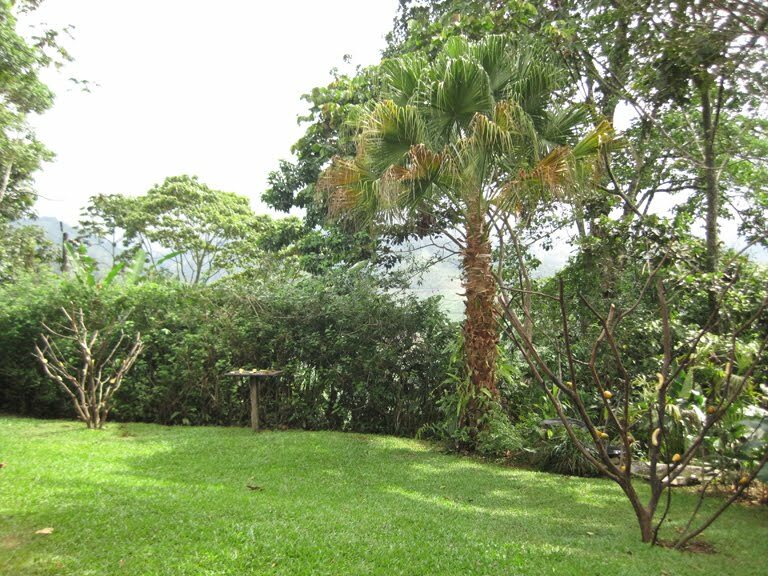 This is where we hoped to see the trogons with the special name that like to eat avocadoes. The quetzals measure 14 inches long, but the males sport some incredible uppertail coverts that grow up to 30 inches longer than the square tail. Contrary to popular belief, the flamboyant feathers aren't true tail feathers, according to Richard Garrigues. 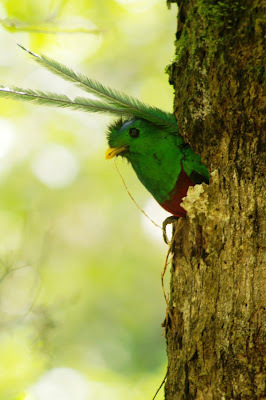 Soon, Alex spied the nest hole in a tree fairly close to the road, and then he located a male Resplendent Quetzal. Distant and visible through dense leaves, the bird appeared to have food in its beak -- which the spotting scope confirmed. Aren't those uppertail coverts extending to the bottom of the photo just incredible?! That shade of green looks so flashy in contrast to his deep-red belly. 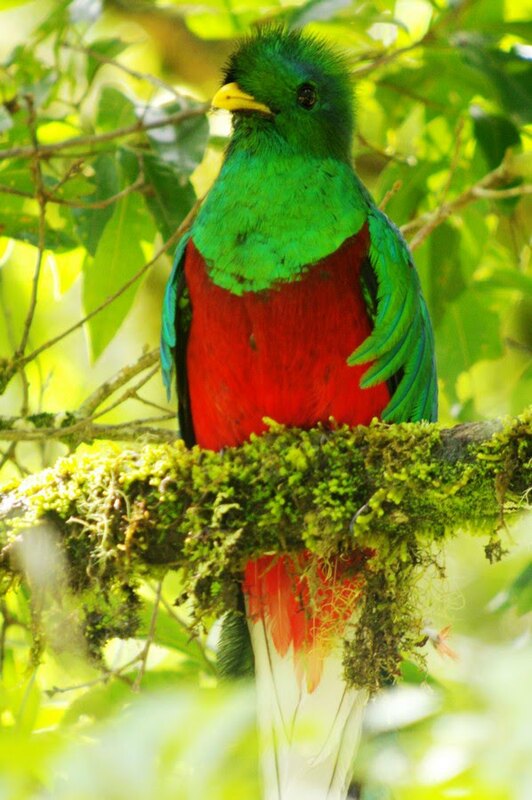 Who could resist the visual appeal of this trogon? 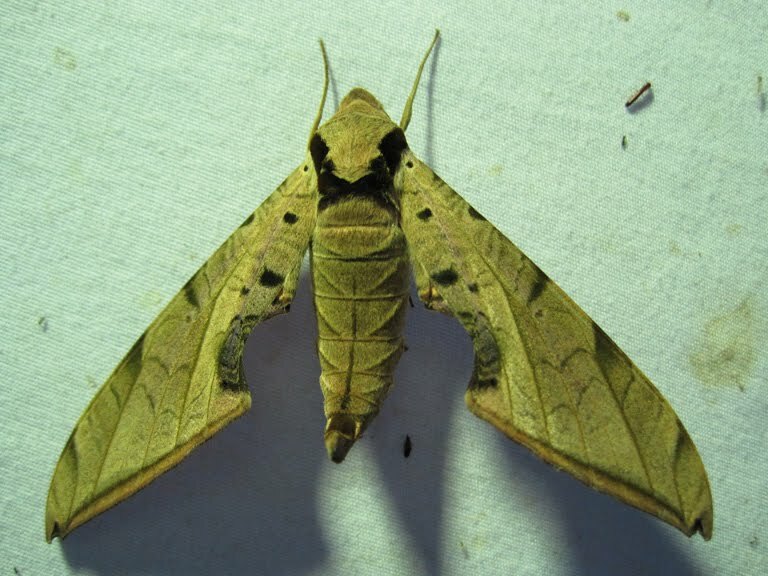 No wonder the Guatemalans named their currency after this species. 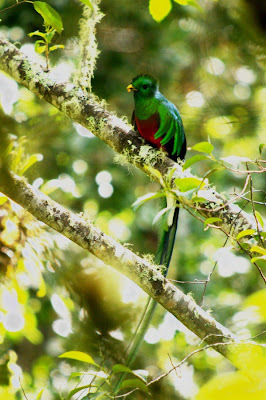 A bus of British visitors stopped near us, and the men and women marvelled at the Resplendent Quetzal with us. The bird flew to a closer perch, and everyone's cameras clicked incessantly. Then the quetzal flew to its nest hole, popped inside -- although its green streamers remained outside -- and then emerged without food. He created quite a stir among his admirers, and one rivetted British tourist almost missed the bus as it pulled away. The dapper fellow flew to a more open perch, sat for a spell and preened while we continued soaking up his magnificence. We felt quite fortunate to enjoy such good, prolonged looks at this beautiful species, considered "near threatened" by IUCN Red List of Endangered Species and listed in Appendix 1 (the most endangered species, threatened by extinction) by the Convention on International Trade in Endangered Species of Flora and Fauna. 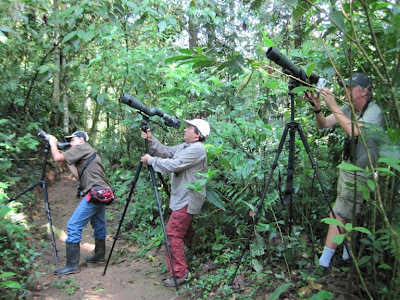 Given our incredible sightings during the morning at Savegre, how could the afternoon at Rancho Naturalista hope to compare?